Top 10 Ways My Mom Totally Rocks (a post of great prejudice) :) - JP loves LIFE! Its Mothers Day and I could go any of several directions with a post about my mom. I could go totally sappy with the kinds of things she’s done to make me and my brother & sisters better people, I could crack jokes about how she’s put up with us for decades and how she may want to revisit having all four of us kids, but instead I think I’ll do a combination of those two things with a Top 10 list, because it seems to be most like my family and our feelings — a combination of knowing we’ve been blessed and the knowledge that the blessing includes great fun and laughs. I should make it clear these are the top 10 to come to mind today, but there are lots more! Mom figured out decades ago that the mothering qualities of caring and nurturing did not need to be limited to just her children by birth. She has been such an incredible part of so many lives and so many families that it would astound most people. 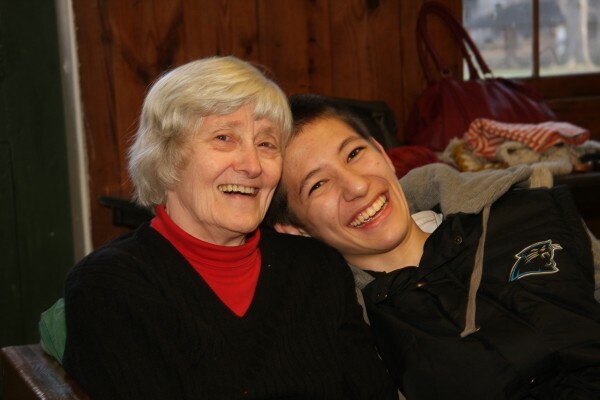 I know that a lot of the people from church cannot imagine what their world would be like without her but it extends well beyond that community. I have friends who always ask about her whether they live in Memphis, somewhere else in the US or any of numerous foreign countries. She shows us everyday that you can choose how you greet the world. Things weren’t always easy for mom but I would have never known that until I became an adult and saw some of the less than positive things that happened along the way. She virtually always has a smile on her face This great smile was prompted by joking around with my nephew Kazu but those who know her, know its always genuinely on her face. She makes everyone around her smile. She gives me high hopes that one day when my hair is grey, it will be that awesome kind of grey hair she has. (hope that doesn’t get in a rush though). Think you are too old to try new? Mom was 60 before she left the US or ate sushi. She enjoyed both and remains game for new things! Mom is willing to celebrate holidays anywhere we can get a few of us together. We regularly take holidays on the road — that means various states as the siblings are all scattered here and there but it also means a willingness to celebrate in Memphis at any of several houses. 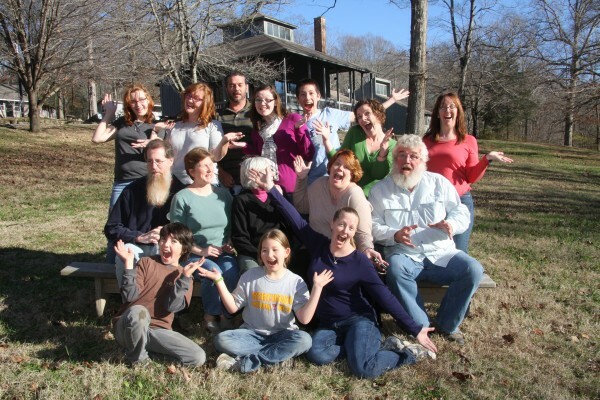 This year Easter was in Memphis with the egg dying and hunt held at our dear friend Debra’s house. 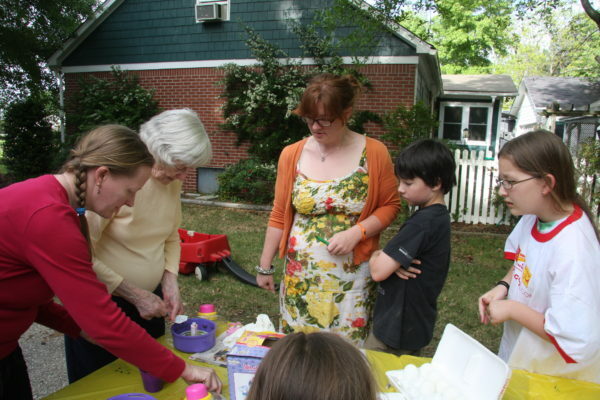 Mom was right there with kids, grandkids and her great grandson Jake, showing that not only can she dye eggs old school, but she’s willing to take an egg for a spin too! She plays favorites — with whoever she’s talking to at the moment! She appreciates all of us for the different things we do and people we are. She doesn’t see people by the labels others may put on them and she helped us see to look beyond them too. Mom helped develop our senses of independence, something I think we need more of in today’s world. What’s really cool is she found a way to do this without jeopardizing our connectivity. This woman loves Memphis and has helped make sure all do as well. We grew up knowing we could live in the same neighborhood virtually our whole lives (which is what my grandmom did with it being even the same house) and though neighbors changed, that was fine. she also helped us see that choosing other paths could work well too with the knowledge that out of sight never meant out of mind too. Mom helped me see others judgement doesn’t have to deter our paths enjoyment of other things. I remember so clearly an evening she hung out with me while I was in college listening to live music. Some thought it wasn’t her crowd but she just smiled and said she was enjoying the music. She really was part of the crowd. Because of our mom, our family has a center to celebrate. We do that today in several places – I am in St Louis, Ray and Elizabeth are in Ohio at their home, Cheryl and the majority of her family are in North Carolina and Leslie & others are in Memphis. All of our hearts and minds are turned toward my mom, the lady who totally rocks our world. That’s her… the calm center in our craziness…. The rock who totally rocks! Not rushing the gray but hers does rock 🙂 Its great to be the favorite now and then too! I love how special that makes everyone feel. Would your Mom like to adopt me? Janice, the is so well written. I can feel your love for your Mother and your family. Angels on you all.